Italy: Rome, the Vatican. Record drawing showing one side of a rectangular panel with a goat and putto within two loops of foliage. You are here: CollectionsOnline / Italy: Rome, the Vatican. 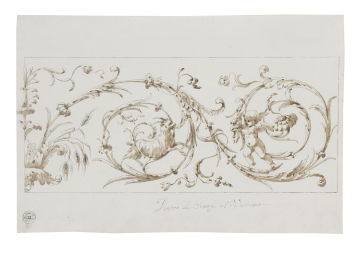 Record drawing showing one side of a rectangular panel with a goat and putto within two loops of foliage. The inscription on this drawing is the same as that at the bottom of Adam vol.26/15, and the draughtsmanship of the composition is similar.